It was learnt from the multiple high-level sources that the sudden uncooperative disposition of the Sudanese government in the matter “is not unconnected with the influence which the traditional ruler is known to wield in Sudan, as well as his contacts over the years in that Islamic country”. All efforts to get official confirmation from the National Information Centre, the body saddled with the co-ordination and dissemination of information regarding the war on terror, proved abortive. However, sources in the intelligence community insisted that a good lead was being followed in the matter concerning the monarch. “It is something that is very discreet that we are doing but I will neither confirm nor deny to you that we are carrying out investigation to substantiate the claims of complicity by the monarch”, a highly placed source said. It was discovered that the main reason for the “forceful blocking of the extradition of Ogwuche is to stall any possibility of his return to Nigeria and buckle under intense interrogation and possibly reveal the names of the sponsors of the insurgents”, the source said. Indeed, the Sudanese Embassy in Nigeria may be playing footsy as our correspondent, Victoria Ojeme, who had earlier interviewed the country’s ambassador to Nigeria, Dr. Tagelsir Mahgoub Ali, spent over four hours at the embassy, on Friday, in her quest to seek clarifications on the extradition saga. The interview with the ambassador had been published last month and it centred on the anticipated cooperation of Sudan in extraditing the Nyanya bombing suspect to Nigeria. But, on Friday, all efforts to get the ambassador to clear the air on the monarch’s links to the continuing difficulty being encountered by Nigeria in the extradition of the suspect did not yield positive result. However, after the over four-hour wait at the embassy, what Sunday Vanguard got was to the effect that the case was being handled by Interpol and it had received a court order from Nigeria while there is an Interpol procedure which, as soon as it is properly followed to the letter, “everything will be in place”. `No extradition treaty’At press time, Sunday Vanguard was told by a top security source: “President Goodluck Jonathan is ready to go to any length, working with the security agencies, to get to the root of the matter and ensure that Nigerians are spared the terror unleashed by insurgents. Nobody, no matter how highly placed in the society, would be spared and the country is ready to ensure that Ogwuche is brought back to this country to face the consequences of his alleged action”. Saturday Vanguard had, yesterday, reported that Sudan’s refusal to extradite Ogwuche followed the alleged intervention of the monarch. He was said to have moved in to stop the extradition of the suspect using the instrumentality of his alma mater, African International University, in Sudan. Apart from this, Sudan whose President, Omar al-Bashir, is wanted by the International Criminal Court, ICC, for genocide, war crimes and crimes against humanity in Darfur, has no bilateral agreement with any country in the world on extradition of criminals. The monarch, who was said to have used alma mater on several occasions to recommend and secure admission for some Nigerian youths in Sudan, allegedly used his influence to reach out to some old students of the university to frustrate the extradition of Ogwuche possibly to prevent Nigerian security from getting details from the suspect on some of the financiers of Boko Haram terrorists in Nigeria. Ogwuche was declared wanted by the Department of State Services, DSS, after linking him to the deadly blast in Nyanya which claimed over 75 lives. However, the arraignment in absentia was again allegedly questioned by the Sudanese government which also doubted the genuineness of the allegations against the suspected terrorist, saying that he (Ogwuche) could have been framed. 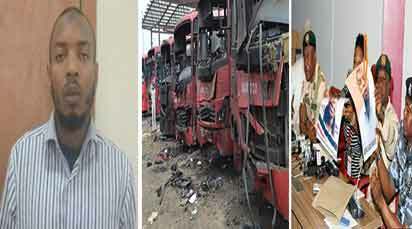 The Police Force Public Relations Officer, Frank Mba, had, shortly after the Nyanya bomb blast, hinted that Interpol had issued a red alert for the arrest of Ogwuche, who was once arrested on suspicion of terrorism but released following pressure from human rights groups and the father of the suspect. Also, the Director General of the National Orientation Agency, NOA, and Coordinator of the National Information Centre, NIC, Mike Omeri, had said that Ogwuche, who had been on the wanted list of the security agencies, was arrested in Sudan. Omeri, who was surrounded then by spokespersons of the military, the police and the DSS, said security agencies in the country were working with their counterparts in Sudan to extradite the suspect, who was a deserter of the Nigerian Army. Deputy Director in charge of Public Relations at the DSS, Marylyn Ogar, also hinted that security agencies discovered that the suspect had escaped to Sudan, when his father could not produce him. The discovery of the Ogwuche’s escape to Sudan while five others were arrested prompted the DSS to declare him wanted alongside one other suspect. “Aminu Sadiq Ogwuche, who was earlier declared wanted, has been arrested in Sudan with the efforts of the army, the DSS, the National Bureau of the Interpol based at the Nigerian Police Force Headquarters and security operatives in Sudan”, Omeri said. “The efforts of the Interpol, Nigerian Police and the DSS led to his arrest”. He promised that further information on him and the second suspect would be communicated to the public as they come in. Ogwuche, an alleged army deserter, was said to have dropped out of university in Britain. He reportedly served in a Nigerian intelligence unit. This entry was posted in Breaking News, News, Politics.